I was helping Julie with a class of Y2 children from Abbey Hulton Primary School when we spotted a Peacock Butterfly on the Castle Hill area amongst the bluebells. I have done a little research about these butterflies. The adults spend most of the morning collecting nectar. Males set up their territories around midday, often on the sunny side of a wood, where they wait for a passing female. The male will fly up at any dark object, which is one way of sexing this species since the two sexes are very difficult to tell apart, being almost identical in appearance. When a female is found she flies off, trying to escape the male that is in pursuit. If he succeeds in staying with her then the pair mate. Females subsequently take great care when egg-laying, selecting food plants that are in full sun. Adults emerging in summer nectar on a variety of flowers, building up essential body fats before overwintering. These include Thistles (Cirsium spp. and Carduus spp.). Betony (Stachys officinalis), Bluebell (Hyacinthoides non-scriptus), Cuckooflower (Cardamine pratensis), Dandelion (Taraxacum agg. ), Devil’s-bit Scabious (Succisa pratensis), Fleabane (Pulicaria dysenterica), Hawkweeds (Hieracium/Hypochoeris), Hemp Agrimony (Eupatorium cannabinum), Honeydew / Sap, Marjoram (Origanum vulgare), Privet (Ligustrum vulgare), Ragwort (Senecio jacobaea), Teasel (Dipsacus fullonum), Water Mint (Mentha aquatica) and Yarrow (Achillea millefolium) are also used. 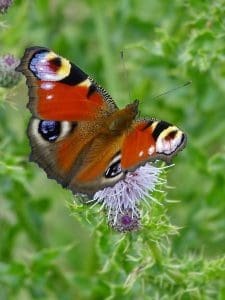 David Proctor wrote about the Peacock and other butterflies in August 2012. While pulling ragwort, (on Tuesday 28th August 2012) a day of early sunshine, changing to light variable cloud with subsequent temperatures around twenty-one degrees Centigrade, creating ideal conditions for butterflies on the high sloping areas at the far end of the extended trail, I was delighted to see a Peacock Butterfly. It was feeding on the nectar of the flower-heads of Common Knapweed, and flitting from plant to plant in the sheltered conditions the nearby wooded area at the bottom of the slope. ‘Eyes’ similar to those on a peacock’s tail feathers make it easy to recognise the butterfly. These ‘eyes’ are used as a means of defence, if the butterfly is disturbed by a predatory bird. Its rapidly opening and closing of its wings displays the ‘eyes’ help to deter the threat. Its eggs are laid on nettle leaves and the hairy black caterpillars feed there before they chrysalis on the plant stem by means of a silk pod. Peacock Butterflies hibernate in winter in sheds or outhouses. Common Knapweed is a tall grassland plant similar to a thistle without any prickles and an alternative name of Hardheads because the flower-head are knob-like; it is also as Black Knapweed. Although the tough stems are prickle free they are they are avoided by cattle allowing the Knapweed to become a menace in some grassland areas. The heads are tough because of rows of overlapping blackish scales surrounding the reddish-purple florets. Later on I was fortunate to see an example of the distinctive Small Copper Butterfly flitting from flower to flower in ideal conditions, searching for nectar. Small Coppers have bright coppery wings with black spots and borders. They are quick fliers and will visit many different plants for their nectar. The caterpillars feed on docks and sorrel. Coppers are abundant except for on high uplands.